Richard B. Fennell « James McElroy & Diehl, P.A. After earning his Juris Doctor from the University of North Carolina School of Law, Rich Fennell clerked for one year with the North Carolina Court of Appeals. Since joining James, McElroy & Diehl, Rich’s practice has focused on complex commercial litigation, construction litigation and securities litigation. He has tried a large number of cases to verdict in a variety of areas, including criminal, personal injury, construction, unfair and deceptive trade practices, shareholder and partnership disputes, insurance and contract matters. 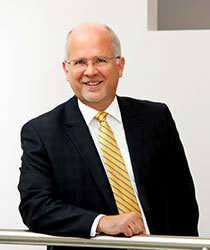 Rich’s verdicts include, for example, a $1.8 million judgment for his client in a minority shareholder freeze out case; a judgment for $105,000 in his client’s favor where the other side contended it was due approximately $900,000 in a bid-rigging and unfair and deceptive trade practices case; a $150,000 verdict in a lost profits case where the other side had offered only a nuisance settlement; a no liability verdict in a $400,000 unfair and deceptive trade practice claim; and a $750,000 arbitration award which was more than twice what had ever been offered to resolve the case. He has managed million and multimillion dollar claims involving business valuation and lost profits calculations which have resolved in confidential settlements. The hope is always to resolve matters short of trial when that is possible and makes good business sense. Rich is a believer, though, in the jury system and enjoys trying cases when that is necessary.